DENVER, March 20, 2018 /PRNewswire/ -- DaVita Kidney Care, a division of DaVita Inc. (NYSE: DVA), a leading provider of kidney care services in the United States, celebrates its more than 1,900 social workers across the U.S. and in 11 other countries around the world on World Social Work Day. "We are proud to recognize National Social Work Month and World Social Work Day in March. 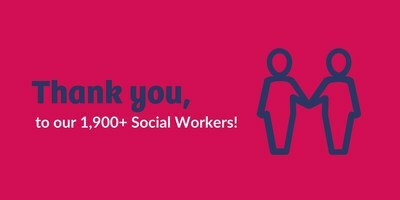 It's a special time to honor the unique contributions of social workers and all they do to improve the quality of life for our patients," said Duane Dunn, national director of social work for DaVita Kidney Care. "Social workers help patients adjust to life on dialysis, educating them about treatment and lifestyle options to help them make informed decisions about their care, and provide ongoing resources and support." Connected with more than 7,000 patients through DaVita's Empowering Patients Program and provided tools and skills to help them manage what is most important to them. Advocated by encouraging our patients to live full and active lives. Acted as champions to our patients as they make informed end-of-life decisions, including choosing their health care proxies. "DaVita's focus is on the patient and delivering patient-centered care every time," said Allen R. Nissenson, M.D., FACP, chief medical officer for DaVita Kidney Care. "Our social workers lead that effort – taking time to listen to patients' needs, understanding their challenges and finding solutions that can impact the quality of life for our patients." Help patients understand kidney disease and treatment options. Support patients in the transplant process. Develop and help sustain a patient's support system. Provide symptom targeted cognitive and behavioral interventions. Advocate for and support patients staying vocationally active. Find community resources including home health services, nutrition support and more.